When you look into buying a ring you will find words such as cathedral mounted, tension and 4 or 6 prong settings. Simple right? We are afraid not. The right ring setting can turn a beautiful diamond into an outstanding one and in turn make it a more personal and unique ring that matches your personality perfectly. 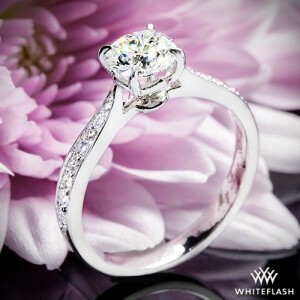 We know how daunting buying an engagement ring can be and so we believe it is paramount that consumers know exactly what they are looking for and what they want when buying that special purchase. You would be surprised at how many consumers do not know their tension setting from their bezel or their 6 prong from a channel but we are here to help with that with our guide to ring settings. 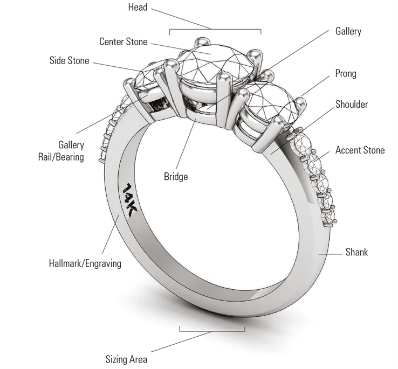 Before we get to ring settings, here is the anatomy of a ring, so when we get on to talking about the shafts, gallery, head and prongs, you know exactly what we mean. The head or setting holds the diamond in place. The shoulder is what attaches the shanks to the setting. The shanks are the sides of the ring where side stones can often be found. The prongs are a type of setting. The gallery is the area under the stone – A large gallery equates more light and a brighter diamond. 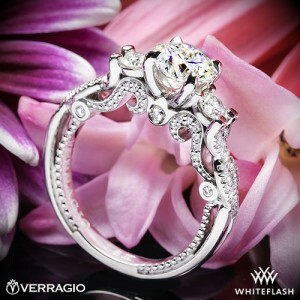 The prong setting is still the most popular setting, accounting for the vast majority of sales in the engagement ring market. Prongs can be rounded, flat, V-shaped or pointed and enable a secure setting with a minimum amount of metal on show, meaning that light can reflect better through the diamond, adding additional fire and brilliance. Prong settings can be high or low with the former showcasing a diamond upwards, thus allowing more light to flow through. A low setting can be better suited to a lady who works with her hands, reducing the risk of the prongs getting damaged. Prong settings are usually available in 4 or 6 prongs. 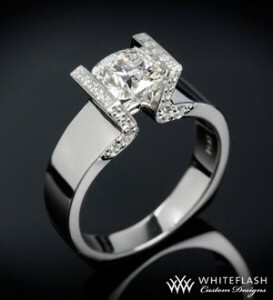 While 4 prongs have less metal, 6 prongs can bring more security so may be better suited to a lady with a busy lifestyle. Care must be taken with prong settings to ensure that they are regularly checked for any lifting or loosening which may weaken the structure, putting the diamond at risk from being lost. The bezel setting is the second most popular ring setting on the market. Due to its contemporary and vintage looks, this setting can suit diamond shapes such as emeralds and cushions perfectly, showcasing them off for maximum impact. The bezel offers some benefits over the prong setting such as additional security to the center stone by encasing it in metal. This setting can suit ladies with an active lifestyle as there is no risk of prongs loosening or lifting. A bezel can be full or partial. Full offers greater protection around the whole diamond while partial usually just encases the diamond at the top and bottom. While the bezel setting does offer additional security to a diamond, it does not offer the same light reflection as a prong setting would and so care must be taken when choosing the diamond to ensure it has been cut well for maximum impact. 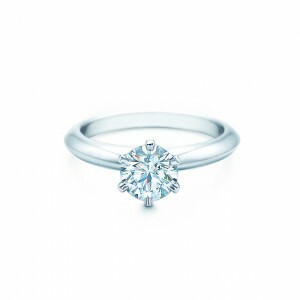 The Tiffany setting is actually a trademarked setting created by Tiffany & Co. in 1886. It was scientifically created to provide maximum light return to the diamond, making it appear brighter and giving off more fire. The Tiffany setting is trademarked only to Tiffany & Co. Many jewelers will offer the setting but it will not be a true Tiffany setting unless it comes from Tiffany. It is a 6 prong design with a knife-edge shaft on a simple band to provide a beautiful light return, maximizing a diamonds scintillation. Tension settings can offer a modern look to a diamond by giving the illusion that the diamond is suspended between two shafts of metal. It can offer increased security to a diamond as a tension setting is usually accompanied with additional settings such as prong or bezel to keep the diamond in place, making it ideal for a lady with a busy lifestyle. 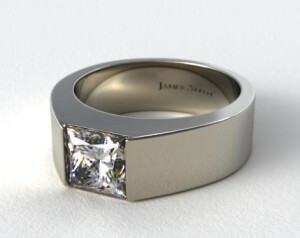 The tension setting is made by using a laser to cut tiny grooves into the metal for the diamond to sit. These are carefully calibrated to ensure a snug fit. This setting can offer an affordable alternative to most of the other settings as much less work is involved to create the desired style. Pavé settings are becoming increasingly common amongst engagement rings as they can bring a truly beautiful look to a solitaire stone by adding extra flashes of light to a center stone. Pavé settings are created by drilling tiny holes into the shoulders or shanks of the ring and placing diamonds into the setting, securing them with a micro-prong setting or beading. The word Pavé comes from the French word ‘to pave’ and as such the name follows the look. 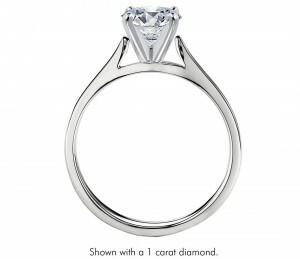 The diamonds up the shanks and shoulders should pave the way for a center stone. Pavé stones can be as small as 0.1 – 0.2 carats, any smaller than this and they are classed as micro- Pavé. If you like the look of the Pavé setting, we have a full section on Pavé and side stone rings which will give you a great idea of what to look for and what style you would like in your perfect ring. As the name suggests, the halo setting gives the illusion of a center stone being surrounded by a halo of smaller diamonds. 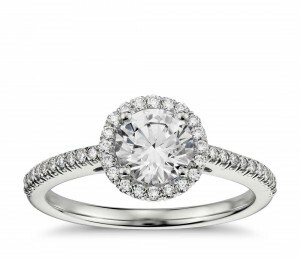 Halo settings can be either square or round depending on the shape of the center diamond. This setting can offer a more cost effective style to a center ring as the halo of micro-diamonds around the center stone can make the diamond appear larger. Often paired with Pavé bands, the halo can bring an adulated scintillation to a lower quality stone by providing more diamonds to reflect the light from. 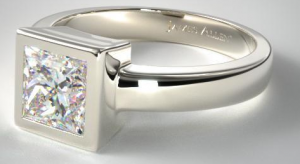 Halo settings can be either single or double with the latter being 2 rows around the center stone and single being one row. As the name suggests, a bar setting provides a bar of metal between the diamond(s) to create a secure setting. A bar setting encloses the diamond on two sides, leaving the other two sides free for added light return. As this setting encloses the diamond, it is ideal for a busy lifestyle or for use on wedding bands or stacked rings. The flush setting is sometimes referred to as a gypsy setting. The diamond sits flush into the band to create a very secure environment. Care must be taken when choosing the stone for a flush setting as during the manufacturing process the jeweler has to hammer the metal into place around the stone and as such a softer stone may crack in the process. 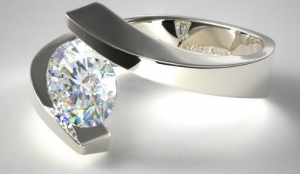 It is a setting often found in men’s wedding bands due to the nature of the way the diamond is mounted, preventing it from becoming loose or chipped. Another setting, which implies the type of setting from the name, a cluster setting is a cluster of diamonds placed together. This setting can make a center stone appear much larger due to the way the stones are grouped tightly together to create an illusion of one large diamond. 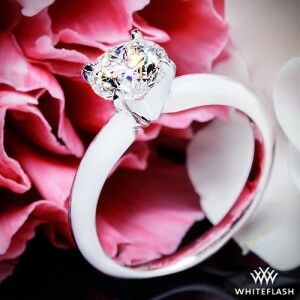 The cluster can provide an affordable option instead of a large center stone, simply because smaller diamonds are much easier to find than larger ones. The channel setting is usually found along the shanks of a ring and can provide beautiful scintillation to a ring. Channel set rings are created by drilling a channel into the shanks of a ring and placing the diamonds together to create a seamless joining. It is a beautiful setting that can showcase a center diamond beautifully or is ideal for using on wedding bands where diamonds are required without the height often associated with other settings. 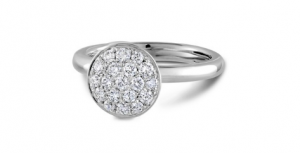 As the name implies, the three-stone setting is one in which three stones are mounted on a ring. This an ideal setting for representing the past, present and future of a couple. Three-stone rings are often seen with other precious stones such as rubies, emeralds or sapphires which can make a wonderful alternative to diamonds and can also add another dimension if these stones are birthstones. It is also quite popular to have the center stone larger than those surrounding it, giving it flexibility for a personal touch and can also offer a more cost effective option. One of the most elegant and classical settings, the Cathedral mount can offer more light return to a diamond by mounting it high with arches underneath the setting. Rather than an actual setting itself, the Cathedral is the way a stone is mounted. Although often seen with prong setting, the Cathedral can also be mounted in bezel and tension settings. The Cathedral will have a beautiful arched design underneath the setting, allowing light to flow underneath the diamond rather than just from the top, giving exceptional light return to create an amazing sparkle, fire and brilliance. Large arches, which will mount the stone higher, can also make a smaller diamond appear larger and so can be ideal for a smaller stone which needs to be showcased. Hopefully we should have now prepared you for choosing the setting that will best reflect your personality. The rest is now up to you to decide which you prefer.